Banff-on-a-Budget is a work of love produced by Jerrold Foutz and Dolores Foutz (Jerry and Dee). Here we want to share with you our enthusiasm for Banff National Park, Alberta, Canada, the Banff and Lake Louis Townsites, and the surrounding Canadian Rockies. 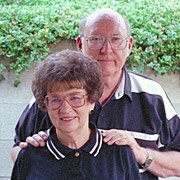 We live in southern California, about half way between Disneyland and Palm Springs -- a popular place for Canadian Snowbirds in the winter. Dee is a retired school teacher and Jerry is a retired aerospace engineer who augments retirement income by working on the Internet. Every year we arrange our schedules so we can spend at least two weeks each summer in Banff. 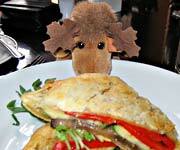 Helping us with the website is Boab (Banff on a budget), a moose we adopted, who now serves as our Banff food critic. Here he exams an offering at the Num-Ti-Jah Lodge. What makes a moose a good food critic? Good question! You can find the answer in Banff Food Critic. Our goal is to provide you practical useful information that will help you explore the Banff area, even if your budget is limited. And believe me, we learned how to be frugal the hard way. When first married, we couldn't afford a honeymoon and it was two years before we could afford to buy a tent and sleeping bags and take our first tent camping vacation. As the children came we continued tent camping, grew into backpacking, then a tent trailer, a 17 foot travel trailer, and now we see the world from a 24 foot travel trailer. We also are experienced in other frugal accommodations and will share our experience in how to find them. Finally, at this stage in life we can afford to splurge a little, so we will share a few high-budget splurges. If you have any comments, questions, corrections, request for additions, or anything else, we would be glad to hear from you. Our email address is provided as a graphic to minimize the success of e-mail scrappers. Just type it into your email program and give it a meaningful subject.